Snrky: So we're launching last week? So we're launching last week? Whether it's about money, customer demand, ignorance, or simply "lighting a fire" under the dev team, most developers are used to constant pressure to release quickly. Most of the time there is enough room to make appropriate trade offs to get something out the door on a timeline that the product team wants, but when developers are unequivocal in their assessment that the system is simply not ready shouldn't one take heed? Maybe if, as some suggest, software development were more like other engineering fields, this wouldn't be such an issue because developers could stand on more objective guidelines about why you can't take shortcuts or skip steps in the process, but I'm glad its not. I like it the way it is. Instead we need to look at the whole process from idea to delivery. Getting software out the door on time is a collective effort, especially at a big company or building a system of sufficient complexity that it warrants multiple areas of expertise to be involved in the creation process. A missed launch date is rarely the fault of a single team. and just because "launching" is the last step in the process (and usually falls to developers) blaming them for a missed date is misguided. Title: So we're launching last week? 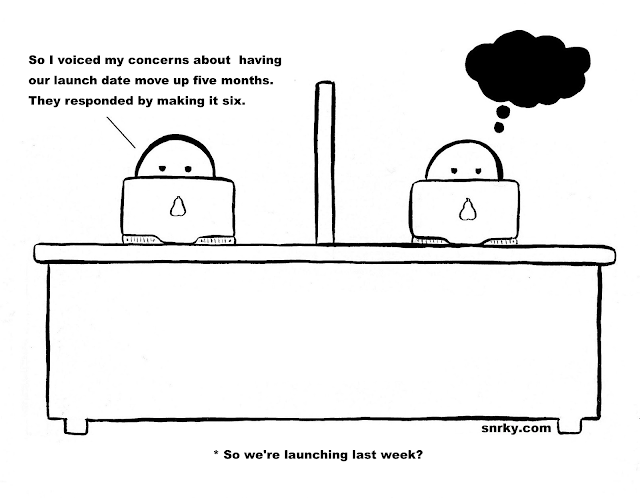 Snarky: So I voiced my concerns about having our launch date move up five months. They responded by making it six.